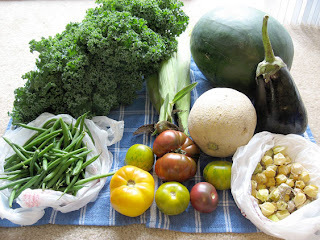 CSA round-up week 7 and a farm tour!! Apparently I ran a half-marathon yesterday. It still hasn't quite clicked in my head, but my sore legs and blisters are a constant reminder that it really happened. Two years ago I would have told you that I had a better chance of sprouting wings and flying to the moon than running a half-marathon. And last year, after developing symptoms of tarsal tunnel syndrome and then tearing a tendon in my foot, I swore that I would never run more than a couple of miles again. The thing that you have to understand about me is that occasionally I'll get a crazy idea in my head, and I go to outrageous extremes to make it happen. Apparently hearing someone say the word "half-marathon" back in May was all that it took. Well, that and an extreme desire to spend as much time outside as possible after the horrendous winter. The race was actually fun... well, at least the first two-thirds of it. I stuck with the 10:00/mile pacers (who were dressed as pirates, complete with sword and flag) and they kept me going just fine. 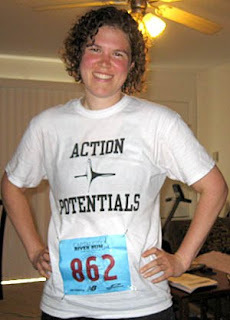 The only problem arose when I accidentally got too close to the girl who liked to flail her feet as she ran. There was a close call, but I managed to keep my balance and get far away from her. I say I'm never going to run another one (and definitely not a full marathon), but we've seen how good I am at keeping promises to myself. As with most long races, there was a pasta dinner the night before the race. Of course there was no way that I was going to pay to watch other people eat gluten-filled pasta, so I threw my own brown rice pasta dinner. My stomach was on the fritz the two days before the race, which made me even more nervous about running, so I wanted something very plain that wouldn't further provoke it. I hesitate to call it bland because I thought it tasted great, but it lacked bold flavors. I bet it was ten times better than what they served at the official dinner. Best of all, my stomach tolerated it just fine and I felt great for the race. Brown the chicken in a large skillet, and set it aside. Add a little bit of olive oil to the skillet if necessary, and then saute onion until it's tender. Add the garlic and cook another minute. 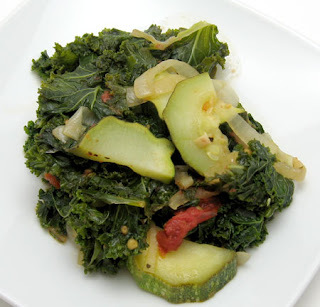 Stir in zucchini, and continue to cook until zucchini is tender (about 7 min). 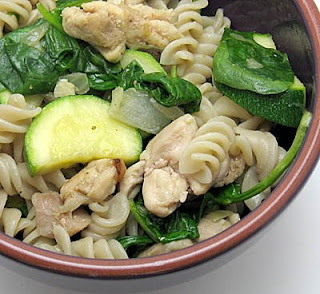 Add the spinach and cooked pasta and stir for a few seconds, just until everything is combined and the spinach begins to wilt. Serves 4 normal people or 2 crazy people who are preparing for a race. I've intended to make more spoonbread for months now, but of course I had to wait for the month when I've consumed so much corn that I'll soon sprout ears. You can stop pretending to laugh now. Zucchini finds its way into sweet breads millions of times a day, so why not use it in savory spoonbread? My goal this month has been to eat as much yellow squash and zucchini as I can so that I get sick of it and won't be sad when it's gone. I'm not there yet, but I'm working on it. This was excellent. It reminded me a lot of the Mexican cornbread that Mom used to make. It has a nice amount of heat, but the corn flavor was by far the dominant component. I can't really taste the squash, but I think it gives it a denser texture. 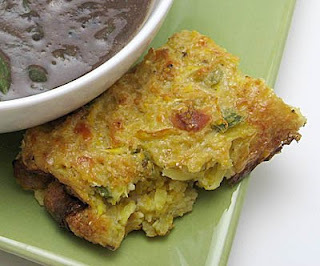 I love that this is really easy but provides the same great taste as cornbread. Combine milk, butter, honey, onion, jalapenos, and garlic in a small saucepan, and bring to a boil over medium heat. When milk begins to foam, remove from heat and set aside. While the milk mixture is cooling a bit, beat the egg in a large bowl and, in a separate bowl, combine the cornmeal, baking powder, oregano, cumin, and salt and pepper. Add a tablespoon or two of the milk mixture to the egg and whisk together. Then slowly add the rest of the milk mixture, whisking as you pour. Then add the cornmeal mixture, continuing to whisk until everything is completely mixed together. Stir in the cheese and squash. Pour this into a lightly oiled baking pan (I used an 11x7" pan, but a 8x8" would work fine) and bake at 375 for about 45 min (until it's nicely browned on top and a toothpick inserted in the center comes out clean). Serves 6. Last week I decided that I needed to plan something fun during the weekend so that I would be able to keep myself motivated. I don't know that most people would think that apple picking is the ultimate reward for working yourself to death, but I'm not your typical person. This is my last fall in Michigan, and I have to take advantage of one of the best parts of living in this state. I found an apple picking buddy, too, so apparently I'm not the only "different" one :). I took the parents picking in August, but there weren't many varieties available that early in the season. This time they had gala (pictured above), empire, courtland, and jonathan varieties, and I came home with a mix of all of them (and quite a few in my stomach). 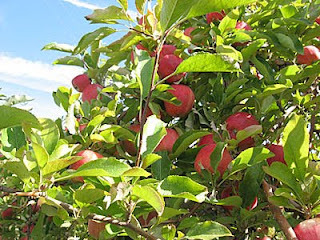 Before we even arrived at the orchard, I knew that I wanted to make applesauce. 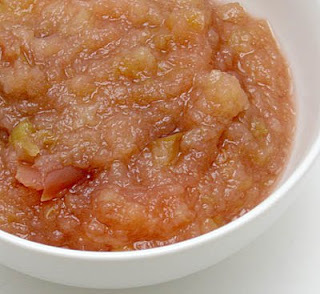 Applesauce isn't very difficult to make on the stove, but I love the crock pot method because it allows me to throw the apples in the crock, go for a run, eat dinner, work on applications, and then have an amazing dessert ready at the end of the evening. A few weeks ago I had some applesauce at Zingerman's, and it was fantastic. By pure coincidence, this tasted almost exactly the same. I guess that's what happens when you rely solely on the unadulterated apple flavors. This is so simple, yet perfect. I prefer leaving the peel on, too, because it gives the sauce a fabulous color and provides a little bit of texture. I enjoyed it warm, but it's also good cold. You could throw cinnamon or honey in if you want, but I'm having trouble adding anything else because it's so good by itself. I'm already planning to make more of this to freeze, and I also want to make more with different varieties as they come into season. Hmmm... I wonder how many times I can go picking this year. I'm submitting this dish to Weekend Herb Blogging, which is organized by Haalo from Cook (almost) Anything At Least Once, and is hosted by Graziana from Erbe in cucina this week. Toss apples in lemon juice in a large crock pot (I used a 5 1/2 qt one). Cook on low for 5 to 6 hours. 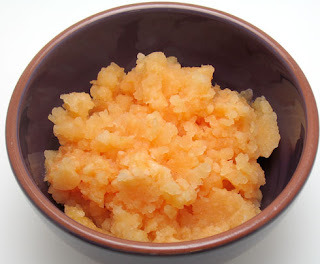 Mash apples with a potato masher or ricer and try not to eat the entire crock of applesauce. Makes about 6 cups. When I first announced that this month's cookbook of the month would be "Vegetarian Planet," Julia left a comment that she worked with Didi Emmons and helped test some of the recipes for the book. How cool is that!?! 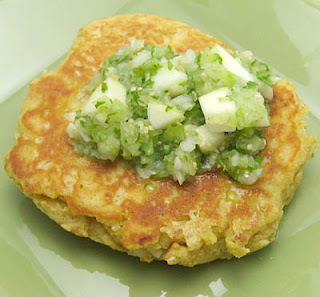 She said that her favorite recipe from the book is masa cakes with salsa verde, so of course I had to make a gluten-free version. This was perfect timing because I just received a huge sampler box of gluten-free corn products, including masa harina, from Bob's Red Mill. Ok, here's the deal: if there's a better recipe in this book, I don't want to know about it. These disappeared so quickly that I'm almost embarrassed to tell you about it. Each cake is huge and filling, but I managed to pack them down in a couple of days. My excuse is that I made them when I was in my day-after-long-run-eat-everything-in-sight mode. They have an excellent corn flavor from the masa and the fresh corn, and the salsa was the perfect complement. I also loved the crunch from the apple in the salsa. Thanks for the recipe recommendation, Julia! To make the cakes, beat the eggs, and then stir in the butter and buttermilk. In a separate bowl, stir the masa harina, baking mix, salt, and baking soda together, and then add this to the egg mixture. Add the corn kernels and continue to stir until everything is completely mixed together. Form five patties from the dough (mine were about 5" wide and 1" thick) and place them in batches in a lightly oiled skillet over medium heat. Cook until they brown on the bottom (about 5 min), then flip and cook an additional 4 min. 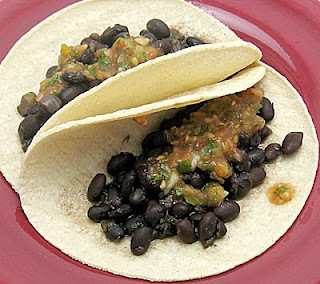 To make the salsa, blend everything except for the apple in a food processor or blender. Stir in the apple and top each masa cake with salsa. Serves 5. 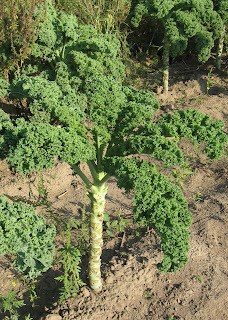 Kale, of course. 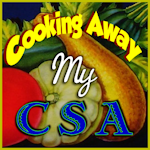 There were many jokes among the CSA members about the insane amounts of greens that we've received and finding ways to hide them in various recipes. 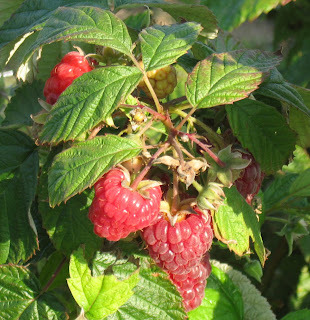 Delicious raspberries! They let us pick as many as we wanted, and I certainly took advantage of it. My favorite activity was the heirloom tomato tasting. They had 17 varieties for us to try, and we voted on our favorite, least favorite, the "most tomato-like", and prettiest. I gave all of them a fair shot, but nothing beats green zebras in my opinion. I also enjoyed the Giant Belgiums, and voted that they had the most classic tomato taste. What happens when you have zucchini, eggplant, tomatoes, and bell peppers lying around? Yep, that's right, you make ratatouille. Not only is it a delicious combination of some of my favorite veggies, but it's also fun to say! Every recipe is very similar, with the only major differences being how the veggies are cut (cubed vs. sliced) and how it's cooked (oven vs. stove). According to Laura Rebecca, technically it's called a tian if veggies are sliced and baked. I don't think you can go wrong either way, but I decided to go with the cube and stove version. This was the perfect dish to enjoy the last bits of summer. I've enjoyed it hot and I've enjoyed it cold, but my favorite part is looking at all of the amazing colors! I'm submitting this to Weekend Herb Blogging, which is particularly fitting given that I adapted this recipe from Kalyn, the creator of WHB. Haalo from Cook (almost) Anything At Least Once organizes WHB, and this week's host is Chriesi from Almond Corner. If you haven't already, go make yourself some ratatouille before it's too late! Sprinkle eggplant slices with salt and let sit for 30 min. Then rinse eggplant slices and chop them into cubes. 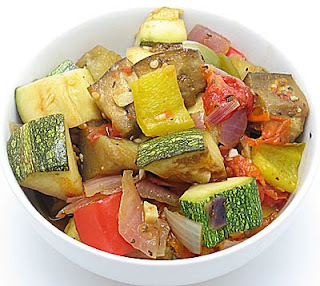 Heat the olive oil in a large pot over medium heat and saute eggplant and zucchini for 5 min. Set this mixture aside and add more oil to the pot if necessary. Add onion, peppers, and garlic to the pot and cook for a few minutes. Stir in tomatoes, oregano, and salt and pepper and cook for another 5 min. 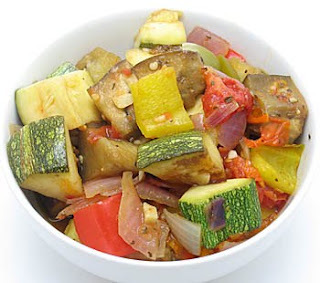 Add zucchini and eggplant back to the pot, reduce heat to low, and cook for an hour, stirring occasionally. Stir in basil and cook for another few minutes. Serves 6. You may remember that this month's cookbook of the month is "Vegetarian Planet". Last week I was looking for something for dinner that was mostly hands-off so that I could "cook" while working. I'm a sucker for anything with black beans, so I couldn't resist the smokin' black beans recipe in the book. These beans were delicious and had a great smoky flavor from the chipotle pepper with just enough cilantro mixed in. I've never used cilantro stems before, and I thought this was a great idea for something that will be cooked. While I was in the Mexican mood, I couldn't let the summer end without salsa. I love salsa on just about anything and, even though I rarely buy tortilla chips because they have a way of taunting me until the bag is gone, salsa never lasts long around here. This batch was particularly good because I used a mix of heirloom tomatoes, and the combination of flavors is amazing. The first night I made tacos with the beans and salsa, and the following night I topped a pink potato (yep, it even has pink flesh!) 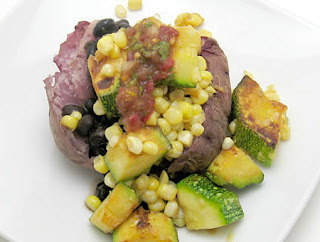 with beans, salsa, and sauteed corn and zucchini. Both were amazing, and the downside of writing these posts a week later is that I can't run to the refrigerator for more. Combine beans, water, chipotle pepper, cumin, onion, and garlic in a medium pot. Bring this to a boil, then reduce heat and let simmer for an hour. Stir in the cilantro and salt and cook until beans are tender (about 30 more min), adding more water if necessary. Serves 3. Put everything in your food processor or blender and process until everything is thoroughly chopped and at your desired consistency. Makes approximately one quart. I've been obsessed with local cantaloupe this year, except that the farmers argue that it's not cantaloupe, but muskmelon. Mom was skeptical that they are different, and apparently she's right. I've also heard them called rockmelons at the market, which is an Australian term for cantaloupe. Who knew that our market had so many international influences? Whatever you call them, they're delicious and don't even compare to what is available in grocery stores. Last week I scored a great deal on several melons that had small soft spots. I saved one of them for this special treat. This sorbet was amazing and incredibly sweet. In fact, if using great melons, it's probably best to skip the honey all together and rely on the natural sugar from the fruit. The taste is fabulous, it's a very refreshing treat, and it's almost too easy to make. So easy, in fact, that I managed to have a huge kitchen fiasco. As I was putting my blender jar on the counter, it slipped out of my hand and dropped on the counter, and the bottom ring broke. The food processor worked fine for this, but I was momentarily upset that I was going to have to replace my ancient blender that I inherited from my parents. Luckily the crisis has been averted, as the replacement that I ordered arrived yesterday and actually fits! Perhaps I need to test it with more sorbet?? Combine ingredients in a blender or food processor and process until smooth. Freeze in an ice cream maker according to manufacturer's directions. Makes about 1 1/2 quarts. One of my favorite things about this time of year is seeing what everyone does with squash. There are endless possibilities and, while I certainly could obtain enough squash and zucchini to make all of the recipes I've read, I can only eat so much food. Believe me, I'm already pushing it to the limit. 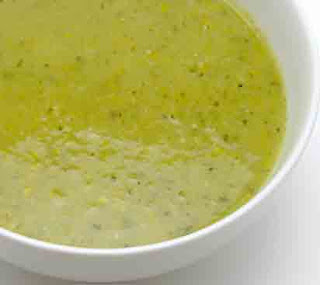 Soup was something that I had to try, though, and I wanted something simple that emphasized the taste of the vegetables. I really enjoyed this soup, particularly the blend of flavors. The cayenne gave it a nice kick, but didn't hide the squash and zucchini flavor. 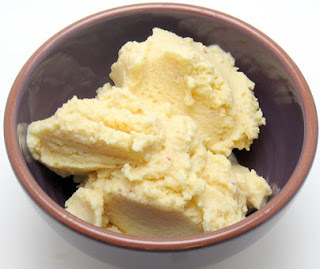 I didn't puree it as much as I could have, so it had a thick and creamy consistency. Well, this one was a success, so now I'm on to the next squash recipe while it's still around! Heat oil over medium heat in a medium saucepan. Saute onion until tender, and then add garlic and cook for another minute. Add squash, zucchini, thyme, oregano, cayenne, and salt to the pot and let cook until the veggies begin to get tender (about 5 min). Stir in the stock and bring to a boil, then reduce heat to low, cover, and let simmer for 20 min. Puree the soup with an immersion blender or in batches in a regular blender. Serves 4. For months, I had a stash of some sort of protein or granola bars in my freezer, but after discovering my gluten intolerance, it took me a while to make ones that I can eat. 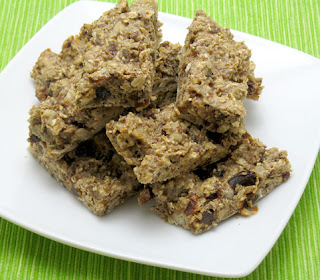 It's definitely not hard to adapt granola bar recipes to avoid gluten because they usually don't involve much flour, so substitutions don't have a drastic effect on the results. I don't know what took me so long to make these, but I'm glad that I have now replenished my stock. This time I decided to give Ellie Krieger's recipe another shot. To be honest, I didn't want to make my standby recipe because it would involve opening a new jar of peanut butter. There's an unopened jar waiting in my pantry, but I don't trust myself right now. Lately I've had an extreme weakness for all things nut-related (I blame it all on running, and I hope it will go away after my race at the end of the month). So in an effort to avoid eating half of the jar in one sitting (and making myself extremely sick), I decided to go for my second favorite recipe. I really like these and they're extremely filling, especially with the protein powder. My bars look somewhat small, but that's all I need to keep me going. In my opinion, they have the perfect amount of sweetness - they're sweet, but not overly so. These also have a perfect granola bar consistency, and I think I'm enjoying these even more than I did last time, but that might be because I haven't had a granola bar in several months. I especially appreciate that this recipe is so simple, although I'm somewhat shocked that the dates and apricots haven't ruined my cheap food processor blade yet. Granola bars are one of my favorite mid-morning or post-workout snacks, and I'm not sure how I lived for several months without them. Put all ingredients except for the honey and eggs in food processor and pulse until well blended and finely chopped. Add honey and eggs and pulse until well mixed. Pour into an 11x7" pan that's been lined with lightly-oiled wax paper. Bake at 350 for about 20 min, until browned. Let cool and cut into bars. Makes 20 small bars. I package mine individually and then freeze them. If I want to take one with me somewhere, I'll pull it out of the freezer in the morning and it's thawed in a couple of hours. If I want one immediately, I throw it in the microwave for about 15 seconds. Somehow they stay extremely fresh! Before I tell you about one of my recent delicious meals, I would like to announce the winner of the fig preserves giveaway. Random.org selected #8, which means that Grace will be receiving the preserves. Congrats, Grace! Also, thanks to everyone else who left a comment! You guys gave me some great ideas for things to do with figs, and now I can't wait to get my hands on more. 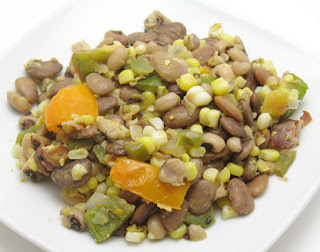 I couldn't let the summer get by without succotash, and I was reminded of this when Alta from Tasty Eats At Home posted a version several weeks ago. Instead of making a traditional succotash with butter beans, Alta used black-eyed peas, and I thought this sounded like an interesting change. With cooked black-eyed peas and speckled butter beans waiting in my freezer, I decided to combine the two. 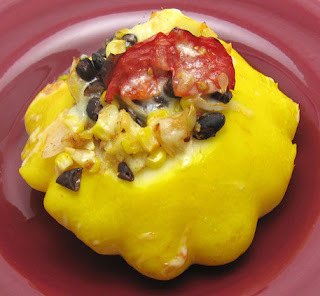 This was delicious, and allowed the flavors of the fresh corn and tomatoes to shine. 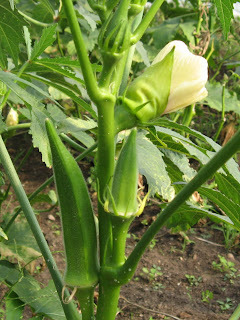 Mine had quite a kick to it, so I recommend removing at least some of the jalapeno seeds unless you're a spicy food fanatic. I think that Michigan jalapenos have been extremely hot this year (I refuse to accept the fact that I may be turning into a wimp), so maybe it wouldn't be a problem with other peppers. But the flavors are great! The bacon gives everything a smokey twist, and I loved using a combination of heirloom tomatoes (I used 2 green zebras and one solid yellow one that I forgot to ask about at the market). This makes a ton, and I happily ate it everyday until it was gone... and I would definitely eat more. Cook bacon in a large skillet over medium heat until it begins to get crispy. Add onion, bell pepper, and jalapeno, and saute until the veggies are tender (about 5 min). Stir in peas and butter beans, and cook for another few minutes. Then add corn kernels and let cook for a few more minutes. Finally, stir in tomatoes and season with salt and pepper, and let sit over heat for an additional minute. Serves 5. New month, new cookbook! This month I've decided to cook a handful of recipes from "Vegetarian Planet" by Didi Emmons. This was the first cookbook I added to my collection when I became obsessed with cooking with local food last year. I really like this book because it has an extremely diverse group of recipes. Many of them highlight some of the produce that will be in the markets this month, including this recipe for an eggplant and cherry tomato saute. I'm obsessed with eggplant and I never turn down tomatoes, so I knew I had to make this recipe. Right now the variety of tomatoes at the market is amazing - there are dozens and dozens of types of heirlooms, each with its own color, shape, and taste. This even extends to cherry tomatoes. I don't often think to combine eggplant and tomatoes, but I loved this dish. I mean LOVED it. The creaminess of the cooked eggplant was really nice with the slightly cooked tomatoes that burst open in your mouth. I already knew that I liked this cookbook, but if the recipes continue to be this good, it might become my favorite. I'm submitting this dish to Weekend Herb Blogging, which is organized by Haalo from Cook (almost) Anything At Least Once, who is also hosting this week. Salt eggplant slices on both sides and let them sit for 30 min (I didn't do this for a long time because I usually don't find eggplant bitter, but I recently learned from Julia that salting also reduces oil absorption). Rinse and dry slices, and then cut them into small cubes. Heat oil over medium heat in a large skillet. 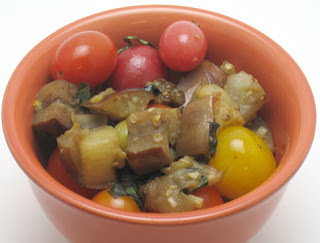 Add eggplant cubes and cook, stirring frequently, until eggplant is tender (about 12 min). Stir in garlic, salt and pepper, and tomatoes, and cook for 4 min. Remove from heat and stir in basil. Serves 4. Needing to use yogurt is never a bad thing. In this case, I knew that I wanted to get more use out of my ice cream maker before I pack it away and crawl under several layers of blankets for the winter. I contemplated making frozen yogurt with some of the fruit already in my freezer, but in the end I decided on the peaches calling out to me from my counter. I love the simplicity of this frozen yogurt. The peach flavor is strong, and provides almost all of the sweetness. This isn't your extra creamy, cloyingly sweet ice cream, but it's light, refreshing, and delicious. I imagine that the recipe would work well with other fruits, too, and I might even crank up my heat this winter to enjoy this on occasion. Toss peach slices with lime juice, spread them out on a baking sheet, and freeze for at least several hours (or use already frozen fruit). Combine peaches with remaining ingredients in a blender and process until smooth. Freeze according to your ice cream maker's directions. Makes about 1 quart. I did a better job with my last share. 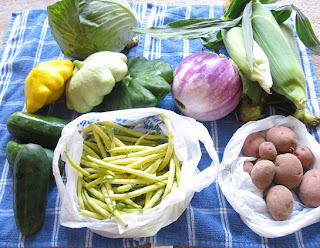 I ended up with cabbage, pattypan squash, an eggplant, corn, red potatoes, yellow beans, and cucumbers. This is why I love summer! The cucumbers made their way into several salads (both green salads and cucumber and tomato salads), the beans and potatoes were simply boiled but still delicious. I don't know how much longer we'll have summer veggies because we've had a cold snap lately, but I hope they can hold on a bit longer - I'm not ready for fall and winter. I was never a huge eggplant fan growing up. I don't think that I hated them, but they would have never made my list of favorite vegetables. Now I can't go to the farmers' market without buying at least one. 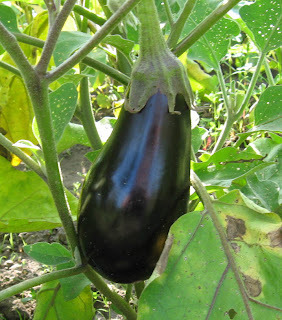 I even tried to grow eggplant this year, but it didn't quite work out (I only got one... and I'm pretty sure that it should get bigger, but it hasn't grown in a couple of weeks). It's an intimidating vegetable - it can be bitter or dry and chewy if not prepared correctly - but it's definitely worth experimenting until you get it right. I was inspired to stuff eggplant again from a post at Healthy Green Kitchen, and I'm a big fan of this recipe. I particularly liked the addition of pumpkin seeds for a little bit of crunch, and the yogurt held the stuffing together so that I didn't make a huge mess when trying to eat it. I was sad that the beautiful stripes in the eggplant faded into a dull purple when it was baked, but I got over it pretty quickly once I tasted it. I'm submitting this dish to Weekend Herb Blogging, which is organized by Haalo from Cook (almost) Anything At Least Once, and is hosted by Chris from Mele Cotte this week. Cut eggplant in half lengthwise, and scoop out most of the insides (leaving about 1/4" attached to the peel). Chop the insides and set aside. Heat the oil in a large skillet over medium heat. Saute the onion until it's tender, and then add the garlic and cook for another minute. Stir in the chopped eggplant, mushrooms, rosemary, and wine. Let this cook until the mushrooms and eggplant are tender and the wine has evaporated. Then add the spinach and cook another couple of minutes until the leaves wilt. Season with salt and pepper. Add this mixture to a mixing bowl with the egg, yogurt, and quinoa. Toast the pumpkin seeds in a dry skillet over medium heat until they start to pop (about 5 min), stirring frequently. Then stir the seeds in with the other filling ingredients. 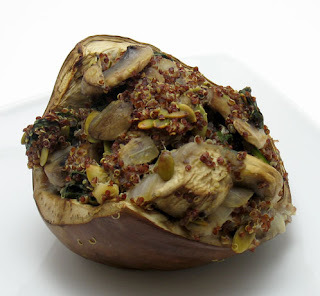 Place eggplant shells in a baking dish and rub the insides with olive oil. Stuff with the filling mixture, spreading any extra filling around the shells in the baking dish. Cover the dish with foil and bake at 400 for 25 min. Then remove the foil and bake for another 20 min. Serves 3. 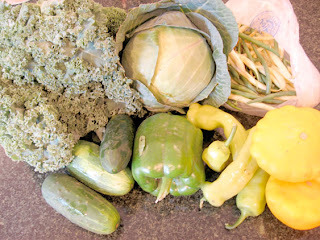 You probably know by now that I can't get enough cabbage, so I definitely wasn't disappointed when Mom suggested that I get one when we picked up my CSA share last week. We didn't end up eating it while my parents were here, but I knew that I could put it to good use. I decided to do a cabbage salad, but I wanted to try something different than my usual Chinese cabbage salad. This Thai version looked delicious, so I gave it a shot. I really liked the way that this turned out. The cabbage wasn't swimming in dressing, so it retained its crunch even after several days. It had a nice amount of spice, too, with that wonderful Thai curry taste. I really don't think that salting the cabbage does much, so feel free to skip that step if you're short on time. And next time I just may add some shredded coconut. It can't hurt, right? 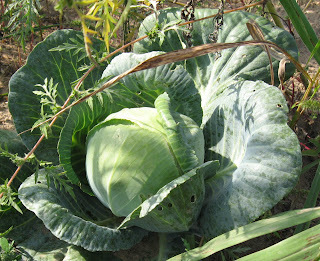 Toss cabbage and salt together in a large colander and let sit for 30 min. Then rinse cabbage and let it drain for a few minutes. Combine cabbage, carrots, chicken, and cilantro in a large bowl. In a separate bowl, stir together curry paste, fish sauce, vinegar, oil, honey, cayenne, and lime juice and zest. 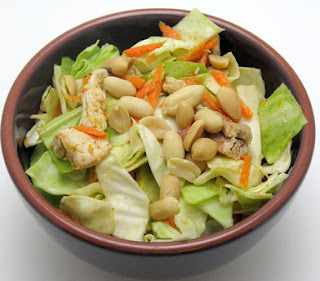 Toss this dressing with the cabbage mixture and sprinkle with peanuts. Serves 4-5. My dad loves carrot cake, and I fell in love with the naturally-sweetened one that I made several months ago from 101 Cookbooks. I knew that Dad would enjoy one for his birthday, so I decided to try out a gluten-free version. I read several comments (both on the original recipe at 101 Cookbooks and on Twitter) that the recipe worked simply by substituting a gluten-free baking mix for the whole wheat pastry flour. Well, I got some interesting results. This cake was moist. Very moist. I've heard horror story after horror story about gluten-free disasters that always turn out dry, so I was definitely not expecting to have the opposite problem. I checked it after an hour of baking, and it was not done. But the inside didn't appear to cook any more over the next 40 minutes. I finally gave up and took it out of the oven. It turned out ok - it tasted just as good as the gluten-filled version, but was just a moist version. After sitting in the refrigerator overnight, it firmed up somewhat and tasted even better. Mom, Dad, and I managed to eat up most of it in the two days before they left, so I'd say that it went over fairly well. Again, I prefer it without frosting - that way it's more of a sweet bread instead of a cake. In fact, I may make zucchini bread with this basic recipe. Mix flour mix, baking powder, cinnamon, and salt in a medium bowl. Stir in walnuts. In a separate bowl, combine butter and dates. In a third bowl, combine bananas, carrots, and applesauce. Stir the butter and date mixture into the banana mix, and then add the yogurt and eggs. Add the flour mixture and stir just until everything is combined. 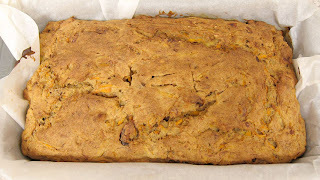 Pour into a loaf pan that has been lined with parchment paper and lightly oiled. Bake at 350 until you get really impatient (mine cooked for 1 h 40 min, and when I stuck a knife in the middle, it still came out with a little bit of cake goo). When you take the cake out of the oven, remove the cake and parchment from the pan and let cool. If you want to frost the cake, whip together cream cheese and honey, and spread it over the top and sides of cake. Store it in the refrigerator, and it's even better cold.